Today is Sunday and I went hiking in the local marsh with mom and dad. Well, mom and dad were hiking and I was sleeping most of the way. Don't tell anyone, but mom and dad were feeling quite like survivors after only 7.5km. Time for me to learn how to run so I can have them chase me around and get in shape :-) . This marsh is awesome for hiking. Since it was Sunday afternoon many people had the same great idea as we did. Besides the many people hiking there were quite some nordic walkers we saw, runners, and bikers out as well. 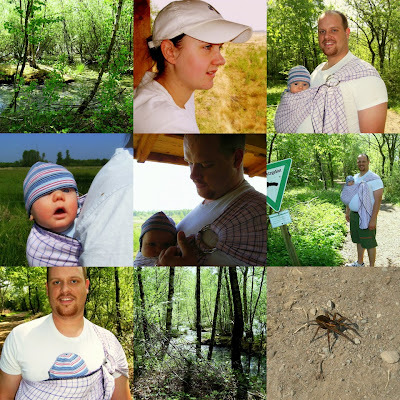 In the marsh you can see lots of trees and bushes and other vegetation, but we also saw some birds, lots and lots of bugs and a huge spider. Also they have extra areas just for sheep to keep the vegetation in check. Kid was lovely and it was a pretty good to see you hike in the marsh.Nice way to spend time with the family.